Operation Finished Business resulted in the arrests of 28 of the 32 people charged in connection with the investigation. Four remain at-large and are considered fugitives from justice. Defendant Anthony Distaulo, 33, of Jackson, acted as the leader of this heroin trafficking network. He is charged with: first-degree leader of a narcotics trafficking network, second-degree conspiracy, first-degree possession of a controlled dangerous substance with intent to distribute, first-degree distribution of a controlled dangerous substance, and third-degree possession of a controlled dangerous substance. Distaulo is being held at the Monmouth County Correctional Institution, Freehold Township, awaiting a pretrial detention hearing scheduled for April 22, before Monmouth County Superior Court Judge James J. McGann. 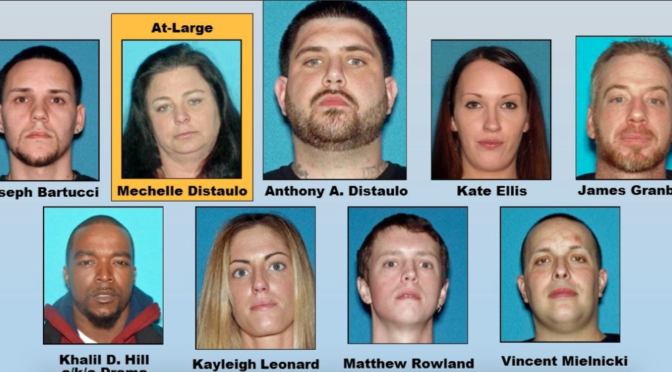 These eight are each charged with: second-degree conspiracy, first- degree possession of a controlled dangerous substance with intent to distribute, first-degree distribution of a controlled dangerous substance, and third-degree possession of a controlled dangerous substance. Bartucci, Ellis, Granberg, Hill, Leonard, Mielnicki, and Rowland are being held at the Monmouth County Correctional Institution awaiting pretrial detention hearings on April 22 before Judge McGann. Mechelle Distaulo remain at-large at this time. 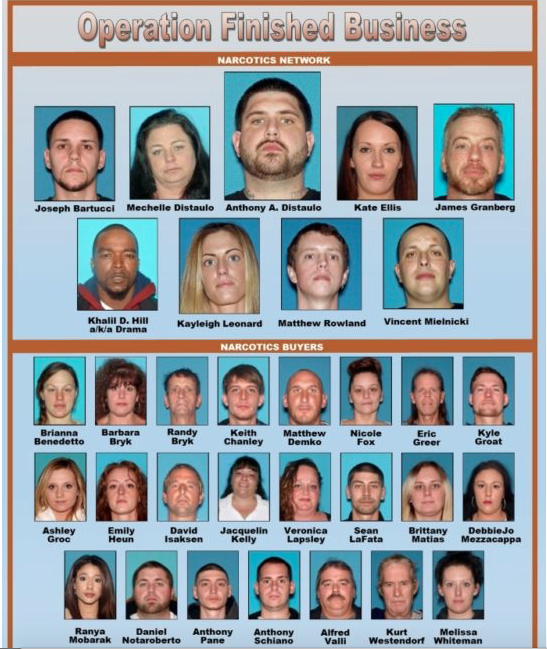 All 23 were each charged with third-degree conspiracy to possess a controlled dangerous substance and third-degree possession of a controlled dangerous substance. Benedetto, Isaksen, and Mezzacappa remain at-large at this time. Possession of a Controlled Dangerous Substance with Intent to Distribute — 5 to 10 years. Distribution of a Controlled Dangerous Substance — 5 to 10 years. Conspiracy — 5 to 10 years. Possession of a Controlled Dangerous Substance — 3 to 5 years. Conspiracy — 3 to 5 years.